Parallel lines have many important properties that you have to memorize in order to be successful in proving problems. In this post, we will discuss the properties of parallel lines intersecting two other lines. We are going to show the relationship among three parallel lines intersecting two lines. 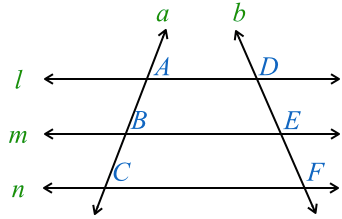 In the figure below, parallel lines l, m, and n, intersect line a at points A, B, and C, and intersect line b at points D, E, and F. The theorem is that the ratio of AB to BC is the same as the ratio of DE to EF. 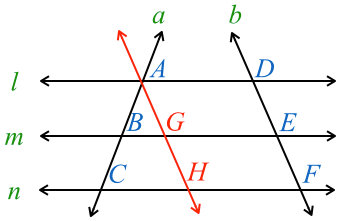 First, we draw a line parallel to b and passing through A as shown below. Let’s name the intersections of that line and m and n as G and H respectively. As an exercise related to the theorem above, you may want to prove the following special cases. (2) A and D are the same point.